The travertine churches of East Jutland. How are rune stones read? Replica of Harald Bluetooth’s rune stone at the entrance to the Danish exhibition in Paris, 1889. 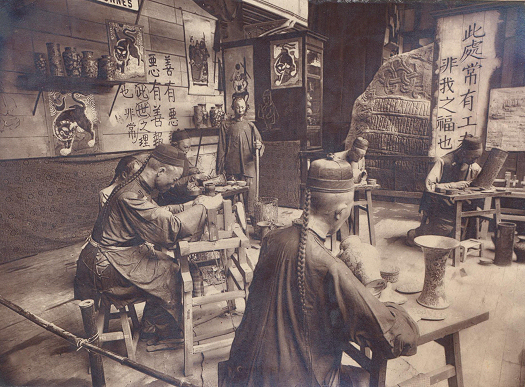 In the foreground are Chinese craftsmen. Photo: Musée d’Archeologie Nationale, Château de Saint-Germain. In May 1889 the Exposition Universelle opened in Paris, celebrating the centenary of the Storming of the Bastille, which today is considered to be the starting point of the French Revolution. The fair covered 0.96 square kilometres, and the main entrance was marked by the great tower designed by engineer Gustav Eiffel, which to this day is still one of the landmarks of Paris. Among many thousands of participants, Denmark contributed with an exhibition of Danish archaeology. It was arranged by the archaeologist Sophus Müller (1846-1934), who had worked with the Museum of Northern Antiquities in Copenhagen since 1878, and museum assistant Kristian Bahne Bahnson (1855-1897). The Danish artefacts were displayed in three separate exhibition cases based on their origins in the Stone, Bronze or Iron Age. This demonstrated the groundbreaking theory of Danish archaeological research: Christian Jürgensen Thomsen’s three-part system of prehistory, published in 1836. Above the cases were two busts of Danish archaeology’s founding fathers, Christian Jürgensen Thomsen and J. J. A. Worsaae. A replica of King Harald Bluetooth’s rune stone in Jelling stood at the entrance to the Danish exhibition. Among the objects in the Iron Age case was the silver cup from the North Mound at Jelling. The replica of the rune stone is today kept in the Musée d’Archeologie Nationale in Saint-Germain-en-Laye, west of Paris. The museum’s inventory from 1889, number 31.749, records it as a donation from Sophus Müller. The copy consists of thin, and today very damaged, shells covering a stone-built core. The World Exhibition in Paris, 1889. Danish artefacts from the Stone, Bronze and Iron Ages. Photo: The National Museum. Replica of Harald Bluetooth’s rune stone at the Musée d’Archeologie Nationale, Château de Saint-Germain. Haraltr : kunukR – Harald King. Photo: Musée d’Archeologie Nationale, Château de Saint-Germain.